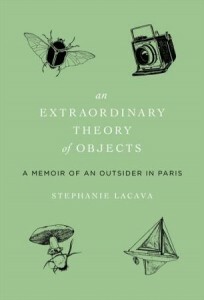 An awkward, curious girl growing up in a foreign country, Stephanie LaCava finds solace and security in strange yet beautiful objects. When her father’s mysterious job transports her and her family to the quaint Parisian suburb of Le Vésinet, everything changes for the young American. Stephanie sets out to explore her new surroundings and to make friends at her unconventional international school, but her curiosity soon gives way to feelings of anxiety and a deep depression. In her darkest moments, Stephanie learns to filter the world through her peculiar lens, discovering the uncommon, uncelebrated beauty in what she finds. Encouraged by her father through trips to museums and scavenger hunts at antique shows, she traces an interconnected web of narratives of long-ago outsiders, and of objects historical and natural, that ultimately help her survive. A series of illustrated essays that unfolds in cinematic fashion, An Extraordinary Theory of Objects offers a universal lesson—to harness the power of creativity to cope with loneliness, sadness, and disappointment to find wonder in the uncertainty of the future. Stephanie LaCava is a writer working in New York and Paris. Raised in France, she attended Colgate University. Her work has appeared in T: The New York Times Style Magazine, Vogue, and other print and online publications, including the Paris Review and Tin House. She posts striking photographs and words daily on her Web site, which she refers to as a phantom cabinet of curiosities. Visit Stephanie at her website, connect with her on Facebook, follow her on Twitter, and see what she’s pinning on Pinterest.